Let’s talk about Turmeric! I love this wonderful spice and have been using it all of my life and for the most part didn’t even know it! I grew up in a Caribbean household and we had vibrant yellow curry dishes for dinner many times. The distinctive golden hue would be in our yellow split pea dahl with rice, or our curried green beans and as the sauce to the chickpea and potato fillings for rotis. It wasn’t until later in life did I realize how medicinal this spice is and how it can be used for more than just cooking! Turmeric or tumeric (Curcuma longa) is a rhizomatous herbaceous perennial plant of the ginger family, and is native to Southern Asia. It’s one of the key ingredients in many Pakistani, Indian, Persian and Thai dishes and has incredible medicinal value, too. Components of 100g (1/2 cup) of Turmeric: 340% of the daily recommended intake of manganese and 517% of iron. It’s an excellent source of fiber, vitamin B6, potassium, vitamin C and magnesium. The two key therapeutic components of Turmeric are turmerone and curcumin. The curcumin is best absorbed with the addition of black pepper. Black pepper contains piperine a natural substance that enhances the bio-availability of curcumin by 2000%. Turmeric is also fat soluble (means dissolved in fat) and it’s best to consume with some sort of fat so your body can absorb it best and get all of the benefits. More info on black pepper & turmeric. Anti-inflammatory properties. Chronic Inflammation is the main cause of almost every chronic disease, and to take down the symptoms of inflammation we look to over the counter chemical medications. Turmeric is a natural pain killer and in taking it, there is no need for NSAID’s (“non steroidal anti-inflammatory drugs” like Motrin, Advil, Ibuprofin, PMS drugs etc) which can cause harmful side-effects and are a direct link to leaky gut syndrome because they inflame the intestinal lining and cause a widening of the spaces between cells, i.e. the leaky gut syndrome. Check out this article: Science Confirms Turmeric as Effective as 14 Drugs. This spice is also a natural remedy for arthritis and rheumatoid arthritis because of these anti-inflammatory agents. Studies have found that turmeric is a natural antiseptic and antibacterial agent and is useful in disinfecting burns and cuts. Antioxidant Rich. 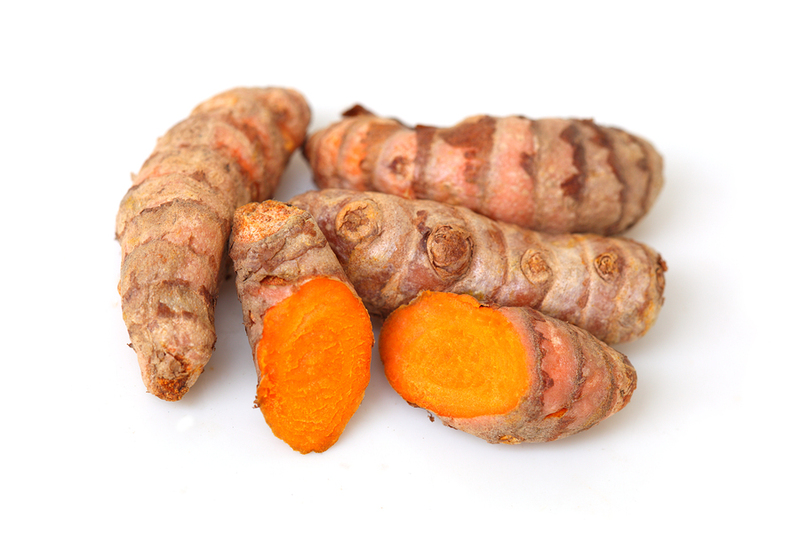 Not only does the curcumin neutralize free radicals, but it also boosts the body’s own antioxidant enzymes! Antioxidants are key to skin repair and restoration. Great for colds and flus. Preliminary studies show that curcumin may help reduce the severity of bacterial and viral infections. I like to make an immunity drink with adding turmeric (info below) to fight colds. Cancer fighting abilities. Curcumin interferes with important molecular pathways involved in cancer development, possibly preventing metastases from occurring in many different forms of cancer. Eye health – A study at the UC San Diego found that curcumin may be able to treat some types of retinitis pigmentosa, a degenerative group of eye diseases that can lead to blindness. Another study found that it may be helpful in the treatment of macular degeneration. Better Sleep – Curcumin may protect against the effects of sleep deprivation. A study found that it prevented anxiety, oxidative damage, and other impairment in mice deprived of sleep for 72 hours. Combating Depression. An Indian study found that curcumin may be an effective treatment for people with major depression. The study compared people who were taking Prozac, curcumin, or Prozac and curcumin together. The group who took Prozac and curcumin together had the best results, while those taking either Prozac or curcumin had very similar results indicating that curcumin may work just as well as Prozac. First thing in the morning I like to take some of the turmeric paste (about 1/4 tsp) and put it in a mug with 1/2 lemon or lime a tiny drop of coconut oil (for better body absorption) and warm water. This is very alkalizing to the body, wakes up the digestion for great elimination and is great for the immune system. Make sure to drink through a straw and rinse out the mouth with water afterwards to avoid tooth enamel erosion. I will add about 1/2 a spoon of turmeric paste to my breakfast smoothies. You can’t even really taste it and it’s packed with nutrients to get you through your day. An example of a smoothie I will do is, 4-6 frozen bananas, a cup of frozen mango, maybe a handful of spinach, 1/2 spoon of turmeric paste, some hemp, flax and chia seeds with half water and half almond milk for the liquid. The almond milk & seeds gives the turmeric the fat content that it needs to make it more absorbable to the body. I will make a salad dressing with a few dashes of turmeric, black pepper, cumin, tahini, apple cider vinegar and a tiny bit of pink Himalayan salt. The tahini (ground sesame seeds) gives the turmeric the fat content it needs. My immunity drink is great for sore throats, infection, colds & flus, you name it! What I do is boil a knob of ginger with a clove of garlic and strain the contents in a mug that has a dash of cayanne pepper, 1/4 tsp of turmeric paste, tiny drop of coconut oil and 1/2 a lemon or lime in it. You can boil a large batch of this and re heat it and drink it throughout the day. I swear by this recipe and it tastes like a yummy savory cup of soup! Golden Milk is another yummy favourite of mine. You heat up any non-dairy milk of your choice on medium heat with 1/4 tsp of turmeric paste, dash of ginger, cinnamon and clove and sweeten with maple syrup! Using carob powder would make a yummy “hot cocoa” without the caffeine effects of chocolate! Avocado toast on organic whole wheat bread or organic sprouted bread is always delish, and you can add a lil bit of turmeric paste in with the spices of your choice! I like to put some fresh cilantro on my avo toast too. The avocado is the prefect healthy fat to make the turmeric easier for the body to absorb. Add turmeric paste to hummus, guacamole, curries, any dish really that you think would go well with the flavour profile of turmeric! Topically I will mix ground turmeric with shea butter and coconut oil and put on my skin for areas of irritation. 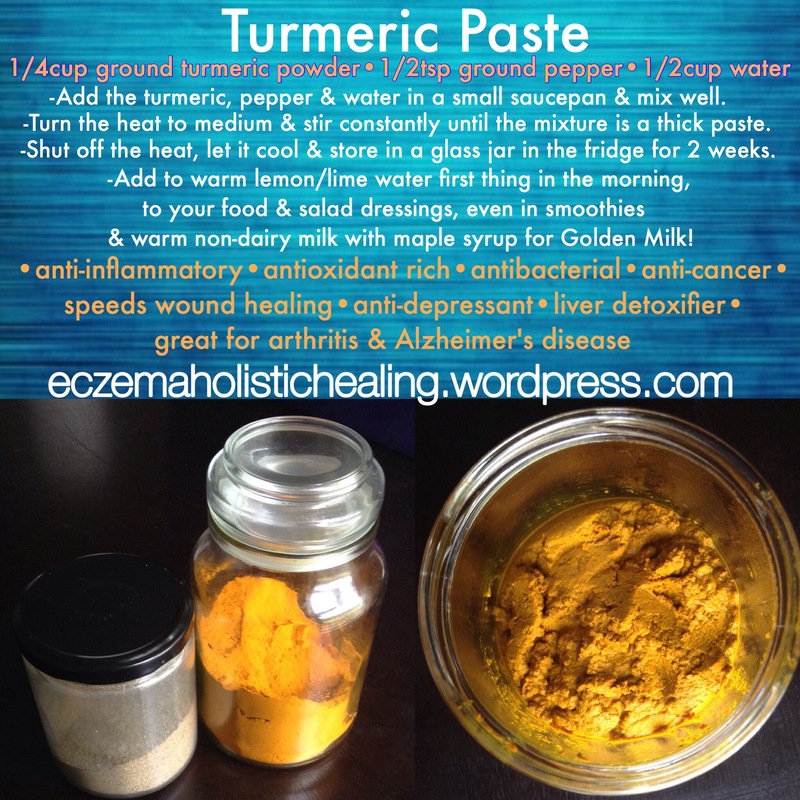 Check out this blog post I did on a skin remedy with turmeric. Add some turmeric paste to a small spoonful of coconut oil for oil pulling! It’s a great way to help cleanse the lymph system and for great oral health as it can help whiten teeth and cleanse the mouth of bacteria and promote healthy gums.